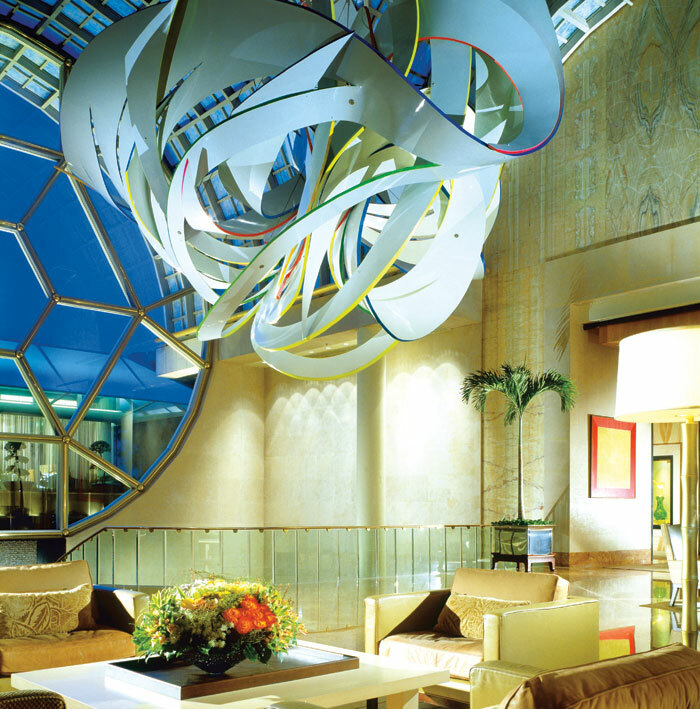 One attraction not enough people seem to know about is the Modern Art Collection of the Ritz-Carlton in Singapore. You can just present yourself at the concierge desk where they will hand you an iPod with a special podcast that will walk you through the hotel to highlighted art pieces. A good indicator that you have stepped in a completely other world in terms of hotels is the height of the ceilings. Forget mere 8 foot ceilings, the ceilings here seem to go on forever (there might be a tiny bit of exaggeration here, but don’t mind me). Next would be the multitude of windows which lets quite a bit of light in. Now imagine these windows being covered in translucent mother of pearl panels… Yeah, that’s what I’m talking about. Now don’t get me wrong, I’m not one to carelessly adhere to brand names. You will probably never see me buy something just because it has a label on it. If I’m looking for a bag for example, it being a Prada will not be a motivator for my buying it. If that bag doesn’t serve the intended purpose, it is useless to me. Now, back to the Ritz, I always thought this name was overrated, until I actually stepped in one. Apart from the Ritz opening up its art collection to tourists (which ranks pretty high in my book), another selling point for me was the courtesy and professionalism of its staff. In my traveler outfit I clearly didn’t belong there, but the staff treated me as nicely as they would have their paying guests. Just like that, the Ritz made it to my list of not so foolish expense after all. Let’s get back to the point though and talk art. So the visit starts with the concierge handing you an iPod and you can learn a few facts about the Ritz’s collection. For one, it is composed of 4,200 pieces of artwork evaluated at about 5 millions Singaporean dollars. Furthermore, it is considered one of the most extensive modern and contemporary art collection of Southeast Asia. 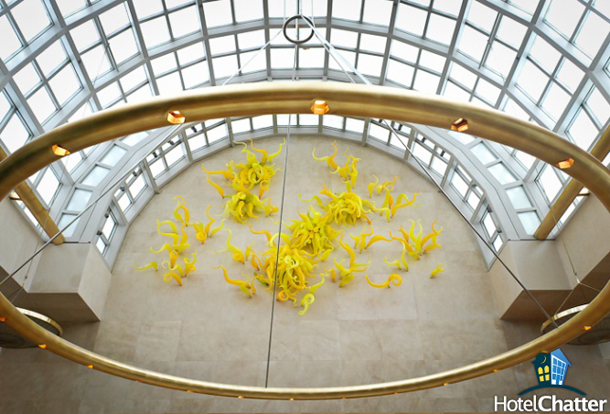 The collection regroups paintings and sculptures (including blown glass and fiberglass). As you are led around to each art piece by he podcast, remember you can always pause the recording to take more time to appreciate what you are seeing. Some of my favorite piece were the blown glass sculpture Sunrise and Sunset by artist Dale Chihuly. They are strategically placed to face each other at opposing ends of the hotel. The fiberglass piece by artist Frank Stella left me perplexed at first, but every time I walked under it, I found myself gazing at it and enjoying it more and more. It is incredible to think that this suspended piece weighs about three tons. I also really liked German artist Rainer Gross. I really liked the composition of his paintings, especially the use of stripes which reminded me of window blinds. I kept stepping closer and farther from his paintings, because it seemed eveytime I did so I saw I hadn’t noticed before. Considering how close the hotel is to the Gardens by the Bay, I might be tempted to recommend doing both in one day. The Gardens in the morning (with a picnic for lunch) and the Ritz’s art collection in the afternoon seem like a good combination to me. My main regret remains not having taken pictures of the artwork I liked. I just wasn’t sure if it was allowed, so I erred on the side of caution. 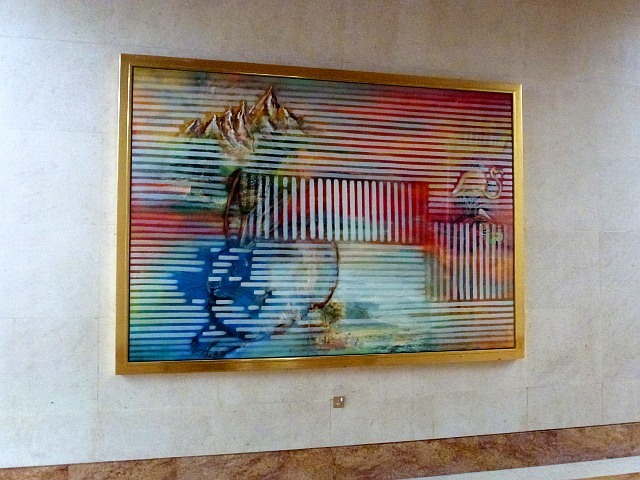 Interested by hotel’s private art collections? There are a few more hotels you can visit, read more here!